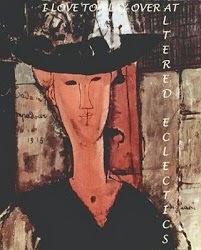 Another card from the Oriental Card book by Marij Rahder. Same technique as yesterdays card, build the image then colour the background. I love this card. Just a little bit different in that you build the 3d image and then colour the background. I added some Alison Ellis Oreintal paper and a gold layer to the card. 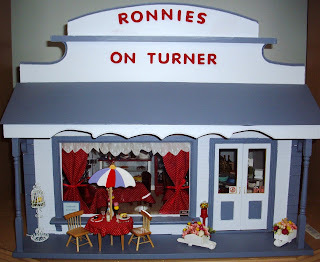 Another of our miniature shops. This is our internet cafe complete with computers and of course a jukebox ... which is actually a working radio. Thank you for visiting this week Have a great weekend and call back soon. Happy Birthday to my brother Geoff. I hope your day is extra special. Cut two flower shapes from the chipboard. You could draw your own flower .Note thatthe flowers are opposite hand so that when put together they match. This is important to remember when cutting the various papers and also when making the holes for the rings. The album pictured measures 15cm at the widest point Cut two flowers from the patterned paper, one for the front cover and one for the back cover. When cutting the flowers, if you are very careful in the placement of the the pattern, you can cut four flowers from one 30 x 30 sheet if you wish to only use one sheet of patterned paper Cut two flowers from the pale green card for inside each of the covers. From the plain piece of card, cut 4 flowers. These will be your pages, you may add as many as you like Mark and punch the holes for the rings. One ring only can be used if you prefer a a flip album. I made this waterfall calendar for a Christmas gift. Very simple to make using the same principle as a waterfall card. I made this card using a 3d image from the Hobby Handig yearbook. 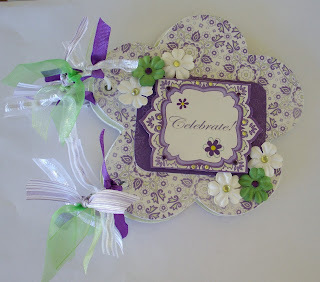 I have also used a Creatables die and chipboard bird and paper doily. Happy Birthday to our special friend Elva. Hope your day is wonderful. 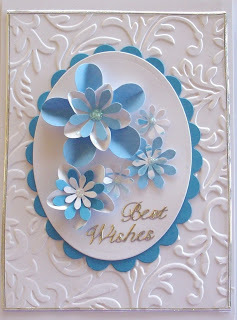 Once again using Cuttlebug embossing folder and Spellbinders dies and punched flowers. I was really thrilled recently to find that my Wedding Explosion Box project has been published in the new eCraft eBook.... Project Ideas for All Occasions From Paper to Fabric Volume 1 eCraft Creations from Craftwell. We are well and truly into our Monthly Craft Mad Sketch challenges. This year we have introduced a new challenge which is Christmas All Year Round. Every month we will have sketch for you to follow and upload to the gallery. By the end of the year we are hoping to have made a really good start on our list of Christmas cards that we need to make. This is my sample card for January. 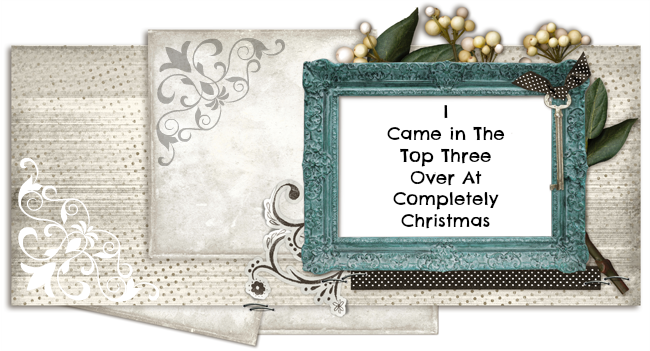 Our other card sketch theme for this month is Chipboard and this is my card. 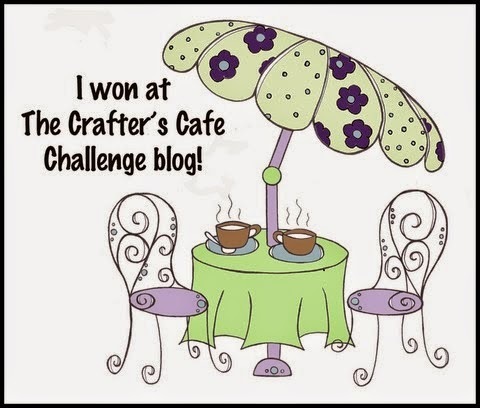 and our Scrapbooking Sketch Challenge this year is also a bit different. We are making a scrapbook album. Each month we will upload a sketch and make a page of an event in your life for that month. At our Create and Chat night we are making the covers for teh album and later in teh year we will make a box to keep your album in.This is my January page. 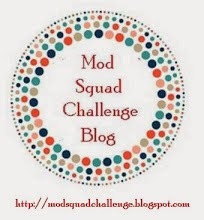 ﻿ ﻿So why not pop on over to Craft Mad and check out the sketches and join in the fun. I have some more embossed cards to show you this week. This one is more suitable for a man. These miniature desks were meant as a bit fof fun and also to tuck a bit of Chritsmas money into for my family. I enjoyed making them so much I made a couple for friends and filled the drawers with little ssurprises. Another of the gifts I made recently. The base is a Kaisercraft kit which I painted, papered and decorated. Another Twiddleybitz jewellery box which I made for a friend. The box comes in kit form and I painted and added a flocked gold and blue paper and decorated with flowers and beads. I made these for my daughter who is a chef from a pattern I purchased at Stampndesign. 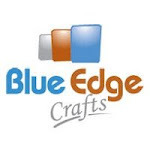 You will find lots of lovely projects on this site. The cards open to reveal a pop up stove and fridge. This pretty little box was part of my Christmas gift to my daughter . It is a Twiddleybitz box which I painted and decorated. I made this for a friend using a Kaisercraft kit for the boards which I painted and covered with patterned paper. I then added some peg clipes to hold notes etc and decorated with flowers and my friends initial. 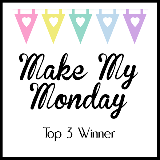 Thank you for viewing my blog this week. Come back soon. I made this frame for my son for Christmas . It was a whitewood frame which I painted, decorated and added a photo of his pride and joy. 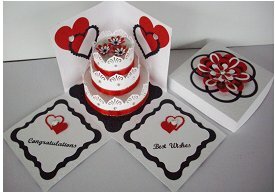 Another shaped card using Creatables silhouette die which I have added to a black card layer and a red glitter sqaure inside the card. Embellished with flowers and rhinestones. I have used a shaped card from Blue Edge Crafts , added an embossed panel to the inside, a glittered circle to the outside and a Creatable silhouette, flowers and rhinestones.